Mark Vaughn Asper is a professional football player, currently with the Miami Dolphins. Asper played football for Bonneville High School in Idaho Falls, Idaho, and the University of Oregon. He selected in the sixth round of the 2012 NFL draft and began his professional career playing with the Buffalo Bills. He was cut on August 31, 2012, then claimed off waivers by the Minnesota Vikings on September 1. On December 24, he was claimed off waivers by the Jacksonville Jaguars. The Jaguars released him on August 25, 2013. He was then signed to the practice squad of the Buffalo Bills on September 1, 2013. 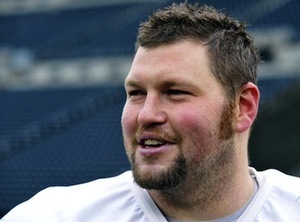 The New York Giants signed Asper as a free agent on July 29, 2014. He was waived off the practice squad on September 22, and then waived by the Denver Broncos in early December 2014. On December 17, he was signed to the practice squad of the Miami Dolphins. Asper was born on November 8, 1985, in Rexburg, Idaho. He and his wife, Michelle, are the parents of two daughters. He is a member of The Church of Jesus Christ of Latter-day Saints. He served a mission to Barcelona, Spain. This page was last edited on 23 June 2015, at 22:29.